The plushly cushioned seat of this tropical chair is a great place to lay back and relax in the sunshine with a favorite book or cool beverage. 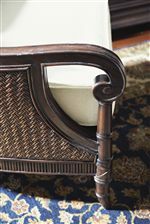 A polished design combines both the sophisticated shapes of classic European furniture with exotic materials to create a tropical look that says fashion instead of kitsch. The frame combines wood and woven rattan in the shapes of elegant, scrolled arms, tall back, and leather-trimmed legs. The loose cushions utilize our Blend Down fill for the back pillow and Ultra Down for the seat, providing the perfect amount of sink-in comfort for each area of your body. 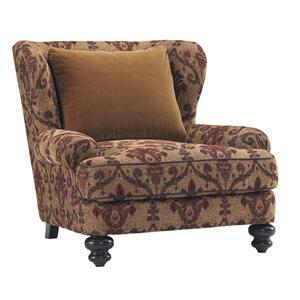 The Island Traditions Tropical Stafford Chair with Exposed Wood and Woven Rattan Frame by Tommy Bahama Home at Hudson's Furniture in the Tampa, St Petersburg, Orlando, Ormond Beach & Sarasota Florida area. Product availability may vary. Contact us for the most current availability on this product. The Island Traditions collection is a great option if you are looking for Coastal furniture in the Tampa, St Petersburg, Orlando, Ormond Beach & Sarasota Florida area.